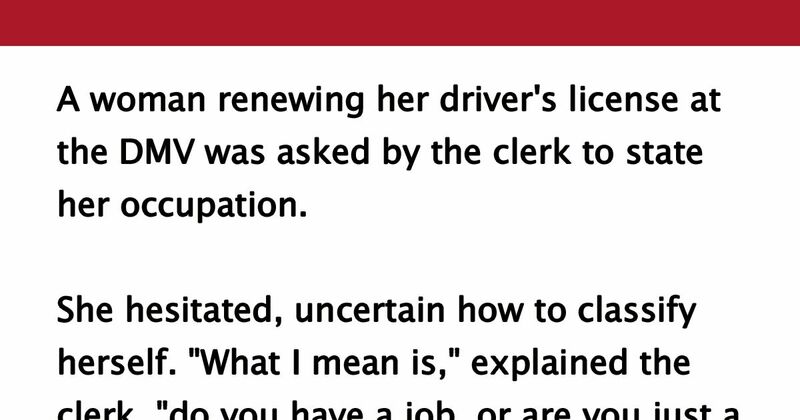 A woman renewing her driver's license at the DMV was asked by the clerk to state her occupation. She hesitated, uncertain how to classify herself. "What I mean is," explained the clerk, "do you have a job, or are you just a ...?" "Of course I have a job," snapped the woman. "I'm a mother." "We don't list 'Mother' as an occupation ... 'Housewife' covers it," said the clerk emphatically. The clerk was obviously a career woman, poised, efficient, and possessing a high-sounding title like, "official interrogator" or "town registrar." "What is your occupation?" she probed. What made me say it, I do not know. ... The words simply popped out. "I'm a research associate in the field of child development and human relations." The clerk paused, pen frozen in midair, and looked up as though she had not heard right. I repeated the title slowly, emphasizing the most significant words. Then I stared with wonder as my pronouncement was written in bold, black ink on the official questionnaire! "Might I ask," said the clerk with new interest, "just what you do in your field?" Coolly, without any trace of fluster in my voice, I heard myself reply, "I have a continuing program of research, in the laboratory and in the field. I'm working for my master's, and already have four credits. Of course, the job is one of the most demanding in the humanities, and I often work 14 hours a day. But the job is more challenging than most run-of-the-mill careers and the rewards are much more satisfactory than just money." There was an increasing note of respect in the woman's voice as she completed the form, stood up, and personally ushered me to the door. I felt I had triumphed over bureaucracy! And I had gone on the official record as someone more distinguished and indispensable to mankind than "just another mother." Motherhood ... What a glorious career! Especially when there's a title on the door. Respect! SHARE if you know exactly what she's talking about!